The Musee Baccarat is located in the former private mansion that was known as the Noailles mansion where the muse, Marie-Laure de Noailles used to give magical parties in this elegant place of pomp and tradition, which was dedicated to painters, writers and musicians. And moving to these new premises in 2003, it was a major step forward for the company who entrusted the whole layout to interior designer Philippe Starck in order to showcase the ideals and demands of the international luxury brand. 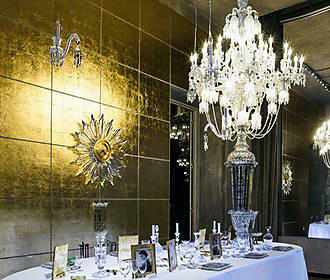 Philippe Starck developed an extravagant and elaborate scheme that would incorporate the gallery, museum and an elegant restaurant in Paris called the Cristal Room Baccarat but still maintaining the original elegance of the mansion like that of the grand ballroom, which blends perfectly with the crystal displays. So, it is here that you can discover dazzling special commissions, sets of glasses, decanters, vases and many different decorative objects like a chess set, ornate chair, or chandelier all of exceptional craftsmanship, which reflect the evolution of decorative arts. You could admire prestigious commissions that were made by heads of states, imperial or royal courts like the Prince of Wales or by international celebrities such as Josephine Baker. Yet you could also look at the legendary pieces that were presented during Universal Exhibitions such as the Turkish enamelled mocha coffee set dating from 1878 and an elephant vase dating from 1880 for instance. There are also limited editions on display at the Musee Baccarat plus specific displays that showcase the skills required for different aspects like cutting, enamelling and gilding, not forgetting the technical feat of glass working including mouth blown stemware. 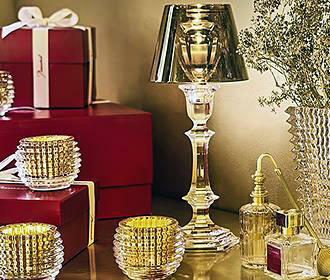 But you can also purchase crystal wares from the Baccarat collection at the boutique, which is also located within the mansion. 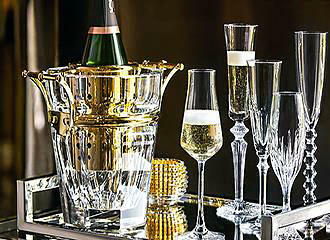 However, if you are already lucky enough to possess a Baccarat glassware set, yet unfortunately you have broken a piece, then you may be pleased to know that they have over 200 different glassware set replacements available, with the oldest dating back to 1823. This crystal museum in Paris is open on a Tuesday through to Saturday from 10am through to 6.30pm, yet is closed on Sundays, Mondays and on all national French holidays. The cost of entry is €10 per person as of 2017, but is free to people under the age of 18, and you may also be pleased to know that the Musee Baccarat is accessible to the disabled, plus they can also gain free entry upon providing proof. Guided tours are also available, but these do need to be booked in advance by email or via telephone on +33 (0) 1 40 22 11 00. Now getting the Musee Baccarat is pretty straightforward as it is located on the Place des Etats-Unis within the 11th Arrondissement of Paris and the nearest Metro stations are either the Iena stop on line 9 or the Boissiere stop on line 6. It is also approximately 500m from the Arc de Triomphe and a similar distance from the famous Avenue des Champs Elysees, plus there are many other tourist attractions in Paris located nearby such as the Musee Guimet and the Musee Dapper for a complete change of scene. For Customer Care, Advice, Orders, etc contact the US on.. The Musee Baccarat is a museum in Paris dedicated to the fabulous Bacarrat crystal, which has been admired for many years, and now, within an exceptional setting, you can discover the elegance and craftsmanship of pieces dating back to the 1800s. 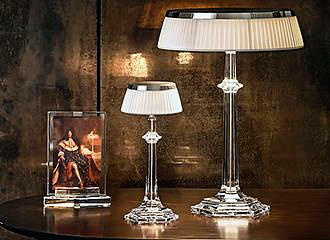 Baccarat, named after Baccarat in the Lorraine region of France where they first established the company, has been embellishing the top tables with their magnificent crystal wares for almost 250 years. With its traditions of excellence, the Baccarat company is still going from strength to strength, and as well as being able to discover the original museum and the factory located in Baccarat, there is also the crystal museum in Paris.